Southerly has moved to her new home today and she seems very happy. However, and I knew this was coming, I need some ideas for dock stairs. I am not adverse to the standard fiberglass but would prefer a handrail on them. Maybe even a detachable handrail? My mom who is not getting around to well these days despite her young age has never seen the boat. She wants to badly. So, all of you who have given me so much help, I'm asking again for your ideas. I know you guys and gals will come up with something. Preferably something I can take with me when cruising, hence the reason for a removable handrail and not too heavy so I can handle it alone. If money were no object, I would just buy a gangplank with a handrail but not looking to spend a few thousand. Checking it out now. Thank you Pau Hana! Just ordered the 3 step little giant! THANK YOU! Thats what I was thinking Psneeld, but I think the little giant will store better for me! That Little Giant ladder looks like a good solution for boarding our Grand Banks 42. Please let us know how well it works once you have a chance to use it. I have a marquip boarding ladder but for the home dock I built stairs out of pressure treated wood. They are almost 6 foot high with a long run out and a sturdy handrail with a 2x2 foot platform at the top. I find them a better more permanent solution. I use the Marquip when traveling. 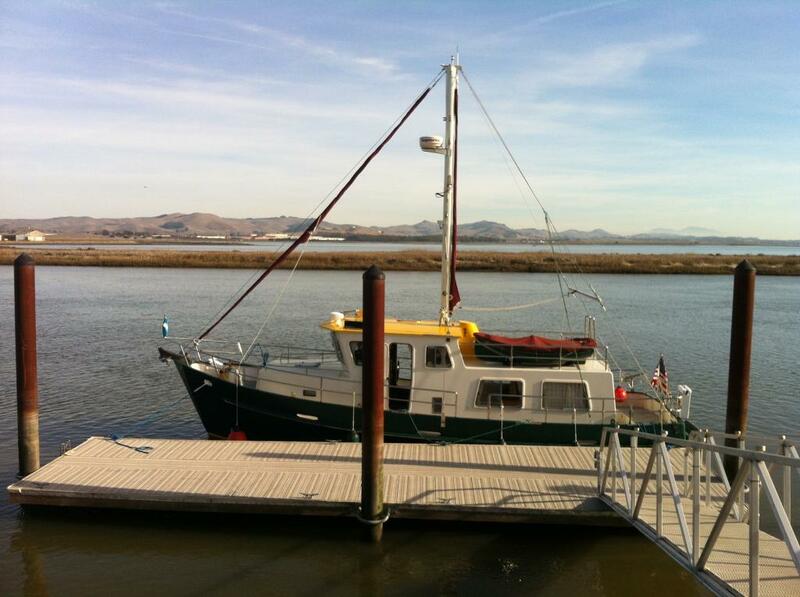 I would be fully challenged to secure a boat if the deck was several feet above the dock. Thankfully, my deck is within vertical inches of floating docks. It should be arriving at my house today!! Gotta love Amazon Prime! I am really excited to get this. I will let you know how this works. that little giant looks to be just the ticket for lots of boats. I'd get a cable lock so it doesn't "grow feet"
Does your new marina have any rules dictating what can be placed and stored on the dock? Some marinas (certainly not ALL) have rules on what they allow on the dock. Many are in the form of the size, type or dimensions of dock boxes to stairs, stair width and type. In the past 10 years I've had a seasonal slips at two different marinas which would not allow a step ladder stored or installed on the dock. I'm not saying that applies to you, just suggesting you double-check if you haven't already. We have been using a 4 step Little Giant for 2 years now to get onto the side decks of our Sundeck from the dock (living aboard for the past year) It works great!!! The only issue is when we have an elderly person on board. (my dad is 89 and his friend is 83). They need a side hand rail for stability that the little giant doesn't have. Since he has only been aboard twice in two years, it really isn't an issue (but something to think about if you have elderly people on your boat) Other than that, it works great! YAY! The little giant has arrived! I have cable locks but will not need it at home port as it is a gated and secured community. I have it on board so when traveling it's handy. The 3 step little giant looks large in my house and my house is quite large. The boat is tall though. Home port is a floating dock but I still can't board without something. I do think I will need the 3 step on a dock that isn't floating at high tide. I can handle it alone even though the box it came in says "heavy". I am less than 120 lbs. I had no problem getting it out and set up is super easy. The steps are not steep, they are wide with a good grip and I love that it has wheels. VERY sturdy. I may need help with my mother getting her on, but dad is always with her. Many boats at my home port have some type off boarding stairs so I don see it as a problem. It will not be in the way of anyone. If the dockmaster takes issue with it, I'll bring it home. I could sure use it here. Tomorrow I'll bring it to the boat. I'm thinking this is going to make life a whole lot easier! Donna...how have the stairs worked out ? I've been waiting for your review in order to make my own purchase.